I am at a loss to know what to think about NO CONTROL which is a look at the issue of gun control. Its not a bad film but I'm not sure the film is what it should be. 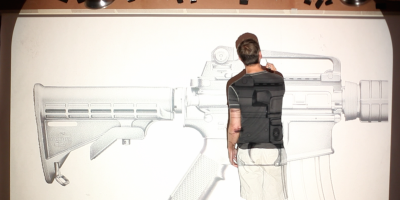 Looking at the various sides of the gun issue the film is hung between the stories of Cory Wilson, a radical political thinker who gave the world the plans for a printable gun called the Liberator and the artist Greg Bokor who creates a 20 foot long pencil drawing of an AR-15 rifle which is to be erased by those who come to see it. Between the two stories we get the the stories of various communities and people affected by gun violence as well as the thoughts of other people with a view point either legal or personal relating to the hot button issue. The trouble is that the two tent pole stories belong in other films. The Bokor art piece, while visually arresting kind of just lays there. I get what he's doing, but at the same time tied to the other stories its kind of small potatoes, The other stories are more interesting. Wilson and the printable gun is decidedly not really a gun issue. Wilson's agenda is something more, as he said at one point the issue isn't about making the gun so much as being about making a wide variety of things. He's not really interested in the gun issue so much as using it to get his other ideas out there. he is a political extremist of a sort and wants to just stir the pot. Why he is in this film when he really doesn't belong is beyond me. What does belong here, and what provides serious food for thought is everyone else. From the legal experts, to the community activists to the gun enthusiasts, to the politicians, there are lots of real interesting ideas being tossed around- sadly most of them get lost because not enough time is paid to any of them nor is there any real attempt to tie everything together, there is no through line other than the creation of Bokor's art and its erasing. Somewhere in all of this material are three great films, but some how I think director Jessica Solace got lost in the weird mind games of the issue which is best described by one interviewee who says that gun violence is down despite more legislation and more guns. To be honest I've seen the film twice now and I'm still not sure what I thin other than the film for all the disorder has some things I need to ponder. The choice to see the film is yours. The film plays tomorrow and on the 19th at DOC NYC. For more details and tickets go to the film's festival page.